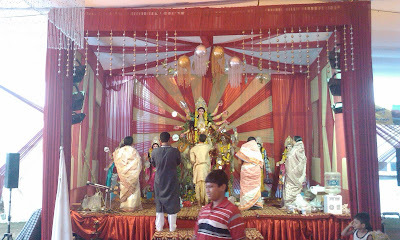 Had a great time this year during the Durga Puja. It all began with Meenakshi doing her morning Puja in the house, with the incense and chants.... really filled the house with something sacred... I don't know what... but I could really feel it and it felt great. Then Eva coming over to our house for a day and then we went to her place twice for the evening Arti!! Was really a heart warming occasion. Then over the weekend went to different places with family and had a good time out! !